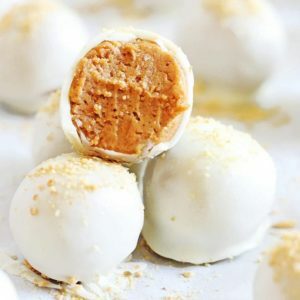 Tiramisu truffles are a wonderful blend of tiramisu flavors (think Italian biscuits, espresso and chocolate) in a delicious bite. The no bake recipe only uses six ingredients! The no bake trend is alive and well my friends. I have been on a kick for quite some time and my latest creation is tiramisu truffles. They are everything you expect from the Italian dessert wrapped up into a bite-sized truffle. The idea came from a couple different places. First up, the countless Tasty videos my sister tags me in, one of which included tiramisu bites. If a day goes by she doesn’t tag me in a Tasty video (or any food-related Instagram) then something is off. That sentence right there just proves we are related. The second place was Tulum, Mexico. I’ve been dreaming about tiramisu ever since I had the decadent and incredibly authentic dessert at Posada Margherita. So I put the two together and made my tiramisu truffles. 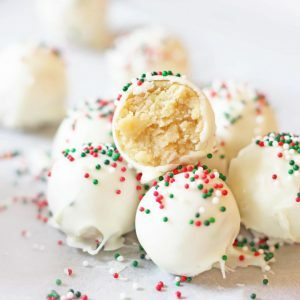 While doing my research for the recipe I came across a lot of recipes, but none of them seemed that authentic (they were using cream cheese, vanilla wafers and white chocolate). I wanted my truffles to be as true to the Italian dessert as possible, all while being a bite-sized treat. So I took the ingredients—lady fingers, sugar, mascarpone cheese, espresso and chocolate—and got to work. I guess in theory making no-bake truffles is kind of like mushing all the ingredients together and praying it tastes good. To my delight (and yours) it does taste delicious. The key is to make sure the lady fingers absorb the flavors, like they do in tiramisu. In this recipe it’s easier for them to do so because the spongelike biscuits are crushed in a food processor then mixed with mascarpone and espresso. Another key to success in this tiramisu truffle recipe is letting the mixture sit in the fridge for 45 minutes to an hour (honestly, you can leave it in there overnight, just make sure it is soft enough to scoop when you take it out of the fridge). During this time, all the flavors get to know each other and really bring out the true flavors of tiramisu. 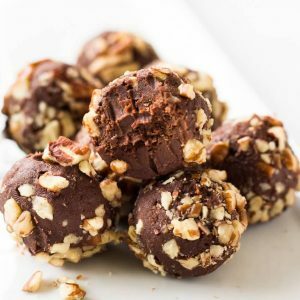 Once that has taken place, you roll the mixture into 1-inch balls, place them in the freezer for 10 minutes to harden up, and dip them in chocolate. That shell protects the tiramisu mixture inside and seals in the flavor. Once bitten into, well, let’s just say you’re in for a treat. In a food processor, blend lady fingers until you have fine crumbs. Set aside 2 tablespoons to sprinkle on the truffles later. Transfer the remaining crumbs to a bowl. Add the sugar and whisk until combined. Using a hand mixer (or stand mixer) add the mascarpone cheese to the bowl and mix until fully incorporated. Add the espresso one tablespoon at a time. You do not want a goopy consistency. It should be similar to a soft cookie dough. Transfer the mixture to a tupperware container and place in the fridge for 45 minutes to an hour. Melt the chocolate (see tips here) and stir in the espresso powder. Dip a cold tiramisu truffle into the melted chocolate and transfer it back to the baking sheet. (I use these dipping tools) Sprinkle the truffle with the crushed lady fingers you set aside earlier. Repeat for the remaining truffles. ¹ I recommend Stella D'Oro Margherite lady fingers. I found them at my local grocery store. ² Cream cheese (3/4 cup or 6 ounces) can be substituted for mascarpone. ³ Strong coffee or coffee liquor can be used in place of espresso. Balls of dough can be frozen in a closed container (or covered cookie sheet) for up to two weeks. Truffles last about a week and should be refrigerated. You can bring them to room temperature before serving if preferred. Thanks, Thalia! My favorite desserts are bite-sized—it means you can have more than one! Oh my gosh – this is brilliant!! I love tiramisu, but for some reason it’s one of those desserts that I’d rather have a few bites than a whole piece, so this is perfect for me. Pinning this for future reference! Thanks, Mara! Yes, a really good tiramisu is so delicious, but incredibly delicious. These bites are the perfect size! Thanks for pinning! I love Tiramisu and the truffles look yum! Would surely love to try this at home…maybe then I will be able to stop after a couple 😉 thanks for sharing. I love the flavor combinations you have going on here. Who doesn’t love truffles? Thanks so much for sharing your recipe with us t at Funtastic Friday. Hi Sali! These will keep in the fridge for about a week, but are best when consumed within three to four days. He will love them! Is there any substitute for the mascarpone cheese? Hi Caia – you can substitute 3/4 cup (6 ounces) cream cheese for mascarpone. 2/3 block of cream cheese. they really look amazing!! one question: could i place the mixture into the fridge overnight instead of for 1 hour?? or would it harden too much? Hi Barbara! The mixture will firm up quite a bit if it’s in the fridge overnight. If you choose to do that, I would let the mixture sit at room temp until it reaches a scoopable consistency. Good luck! Yay! So happy to hear that, Barbara. Enjoy! Looks delish! What brand of lady fingers did you use? I couldn’t find them in my local grocer. Thanks! Hi Kathy! I used Stella D’Oro Vanilla Margherite Cookies. I found them at my local grocery store in the cookie aisle. You can also find them on Amazon (affiliate link –> http://amzn.to/2bw64Ad ). Thanks! Can I do half the recipe with the same results? Also can I freeze for later? Looks yummy! Hi Layah! Good question. The balls of dough can be frozen in a closed container (or covered cookie sheet) for up to two weeks. Before dipping in melted chocolate, let me them defrost slightly by transferring them to the refrigerator. You can also freeze the tiramisu truffles once they are covered in chocolate. They will keep for up to three weeks. You talk about expresso powder being added to the mascarpone. Then the recipe talks about adding expresso to the chocolate. How much expresso powder gets added to the chocolate? How much to the mascarpone? Hi Marji, Thank you for pointing that out. The truffle dough has 2-3 tablespoons espresso (liquid) in it while the chocolate coating has 2 teaspoons espresso powder in it. These look so good. I’m an amateur in the kitchen but I’m gonna try this. What did you use to dip the balls in the chocolate? Hi there! Can you give me a sense of the weight or volume of ladyfinger crumbs that you use in the recipe? I saw your link to the Stella D’oro cookies. Did you use a full 12-oz package for one recipe? Hi Ann, to be honest I don’t remember how much 24 lady fingers crushed turned out to be. I remember using only one package of the Stella D’Oro ladyfingers though. I’ll have to make them again and update the recipe with the appropriate measurements! What type of strong coffee and/or coffee liquor would recommend in place of espresso? Hi Lisa – If you make coffee at home, just make it extra strong and set aside 2-3 tabespoons for the recipe. A dark roast will do just fine. If you choose to use coffee liquor, I suggest using Kahlua. Enjoy! Which strong coffee or coffee liquor would you recommend :)? Hi Bonnie – The lady fingers I used are the Stella D’Oro brand. They’re crunchy! Is there another type of ladyfinger that works if you can’t find the Stella D’Oro cookies? There are two other types I’ve found. One is a soft, sponge cake-like ladyfinger and the other is a crunchy one with a sugar coating on top. Thanks in advance, as I”d love to make these for holiday gifts. Hi Marlene – The lady fingers I used are crunchy so I would use that brand. When you blend the lady fingers in the food processor, be sure to get them to fine crumbs. Enjoy! Made these tonight to give for christmas gifts! Loved how they weren’t super sweet like cake balls! Perfectly balanced, next time I would use a full Tbsp coffee liqueur and the rest espresso! Loved the crumbs on top! I got 24 truffles, used Ghirardelli chocolate, BelGioso Mascarpone, and Savioardi (sp) crunchy ladyfingers! Thanks for sharing this great recipe! What is the servings size and calories? Hi Denise – The serving size is one truffle and there is roughly 120 calories per truffle. This is a very rough estimate as each truffle may vary in size and ingredients may vary in calories as well. Hi could you tell me how many truffles his recipe yields? Thanks! 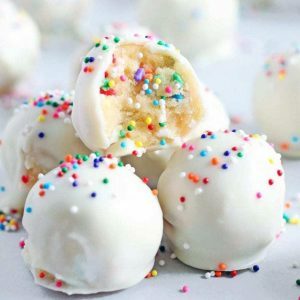 Hi Erin – This recipe yields about 36 truffles. Hi Linda – The truffles last about a week and should be refrigerated. You can bring them to room temperature before serving if you prefer. As we do not know this biscuits in italy, do you have a sgesstion to substitute them, shortbread, graham??? Hi Sanja, I came across lady fingers when I lived in Italy. If you cannot find them, I suggest using shortbread instead. Hi,I made this today and they were great as expected,although my husband said they were a little sweet…to be fair I used regular milk chocolate…what semi sweet chocolate would you recommend? 50% cocoa or dark chocolate?? Hi Zahara! Yes the milk chocolate will make these truffles rather sweet. I suggest a semisweet chocolate, which usually has a cocoa content of about 60%.